It’s shaping up as another season of amazing dreams and stories for those hoping to reach the North Pole – and another potentially disastrous shattering of many of them since the opening of the base camp for expeditions has been delayed at least a week. A three-year-old boy taking scientific measurements, a blind Hong Kong man running the marathon and the first women from multiple Arabian Peninsula countries are among the hundreds arriving or now in Longyearbyen hoping to reach the top of the world during the season that typically lasts most of April. 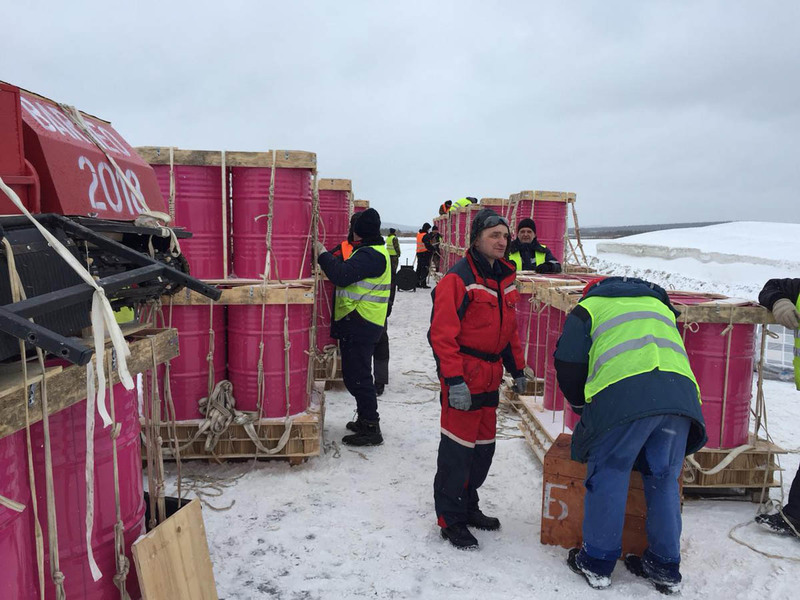 The problem is they’re stuck waiting here because the crew responsible for the Barneo ice camp base at roughly 89 degres latitude north is still stuck in Russia due to logistical problem. Which means adventurers with high hopes – usually pursued at sky-high prices – are facing another potentially disastrous season similar to some in recent years. “At first we planned on starting the aerial reconnaissance in the middle of March, but there was just no way to do that, for the difficulties we met were almost inextricable,” Irina Orlova, the camp’s chief operations officer, wrote in a Facebook post April 1. When the reconnaissance flights finally occurred merely finding a chunk of sea ice large and thick enough for the base camp was a potentially huge challenge since temperatures at the North Pole set a record high during the past winter (and the maximum sea ice cover was the second-lowest ever). But Orlova, in a post early this week, said satellite images show two different regions that appear to have ice solid enough to land cargo planes on. Once a site is picked, workers and gear will be dropped by parachute so a runway can be built on the ice. Reaching the North Pole has always been a formidable challenge of endurance and wits, from the early explorers venturing into the unknown to current-day adventurers trying to achieve new impairment, age or other “firsts.” But in recent years it has also which meant overcoming as many political and logistical obstacles as physical ones. The worst setback occurred when two years years ago when political flare-ups between Russian and Norway during the past several years resulted in tougher flight manifest restrictions two years ago that resulted in flight scheduling chaos. Furthermore, unstable ice conditions resulted in the ice runway at Barneo breaking four times that year. Both setbacks resulted in about half of the scheduled expeditions being cancelled. This year’s backlog is already roughly a week and the fate of how many expeditions manage to reach Barneo – and successfully cross more than 100 kilometers of sea ice – rests largely how how ice conditions prove to be when crews actually try to establish a base. Which means during the coming days the odds someone at the next table in a cafe or standing adjacent in a checkout line may have fascinating tales to tell about their past/present/future ambitions. Take, for instance, the higher-than-normal number of folks jogging the streets around (and in some cases well beyond) town as they wait to depart for the North Pole Marathon, which is now scheduled April 16 instead of the original date of April 9. Among this year’s racers is Gary Leung, a blind Hong Kong resident whose other Arctic race was a 480-kilometer multi-day ultra-marathon in the Yukon. “As much as 70 percent of the North Pole is going to be deep snow, and I need to cope with the weather, but I am more confident than when I went to Antarctica,” he told the South China Morning Post (oh, by the way, he did a 100K ultra-marathon there). But hard as the handicap of losing his sight was in 2009, the real impairment was a resulting descent into depression and alcoholism that he finally overcame in 2011 due taking up long.distance running. Another group facing a weeklong delay is the Young Explorers NORTH Expedition, which will include four children under eight years old. The youngest is Ronin Garriott de Cayeux, 3. The youths, now expected to reach Barneo on April 16, will conduct scientific experiments with the ice and other natural elements, study mythological/anthropological aspects of the North Pole, and present visual/performance art. They will share their exerpeinces daily with more than 200 schools in the Arctic, New York and the U.K. via blogs and live video. The youths are also expected to participate in at least part of the marathon.